Paul McCallum scored twice to take his tally to 11 goals for the season. 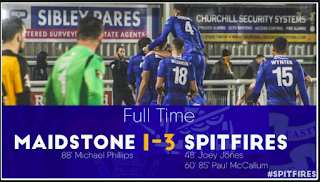 Joey Jones also scored his first goal for the club as the Spitfires sealed a comfortable 3-1 away win at Maidstone. Alex Wynter headed Eastleigh into an early first-half lead. The visitors equalised before half-time through Jordan Hallam. 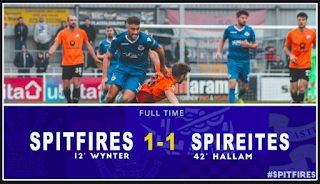 Paul McCallum had a great opportunity to claim a winner for the Spitfires late in the game, who were up against former boss Martin Allen's Chesterfield. Both sides had to make do with a point in the end as Ben Strevens' Eastleigh stretched their unbeaten run to five games. Watch as Strev's gives his thoughts after today's 1-1 @TheNationalLge draw versus Chesterfield. Eastleigh ran out comfortable 3-0 winners away at Barrow. 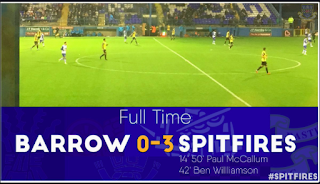 Two goals from Paul McCallum and one from Ben Williamson helped Ben Strevens and Jason Bristow's Spitfires claim all three points in a thoroughly professional display. Watch highlights from Eastleigh's 1-1 draw at home to Salford City. Ben Strevens has been appointed as Eastleigh manager following a succesful spell as interim boss. Strevens said: "After hearing the news on Friday, I can’t wait to get started now. "I’m really looking forward to the job, it’ll be a hard job but I’m really looking forward to it. “My first two games in caretaker charge, I’ll be the first to admit I wasn’t happy with the performances or the results but the boys have responded with their performances away at Halifax and then two real good results against two real good sides (Leyton Orient and Salford). 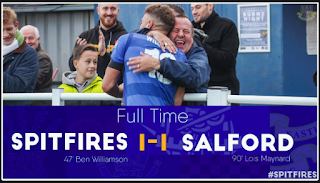 Eastleigh were cruelly denied all three points as Salford scored a late equaliser despite being very much second-best throughout. Ben Williamson netted for the Spitfires who put in a strong display but were unable to convert further chances.